The lack of affordable housing in California is a crisis that should be a top priority for the state legislature. In community after community, working people are being squeezed out by rapidly increasing housing costs. It’s a primary cause of poverty and homelessness, it increases carbon emissions by forcing workers into longer commutes and it forces firefighters, police and teachers to live outside of the cities they serve. This morning in Sacramento, labor unions came together with legislative leaders to demand immediate action on a package of housing bills that will ease the crisis by putting a roof over the heads of thousands of families who desperately need it. Today at the Building Trades headquarters in Sacramento, we had a meeting of elected officials and unions from all over the state who are here to go and lobby our leaders in Sacramento on the issues that affect working people. And they are low wages, an absolute chronic shortage of affordable housing, and the fact that in the construction industry general contractors hire subcontractors knowing that they’re going to cheat their workers. These are the issues for working people, not for the tech giants and the industries of the nation. This is for working people, and we are the plankton that the whales live on. If we can’t live, we don’t buy washing machines and we can’t afford to buy cars, and the economy collapses. They need to remember that working people need to have a wage and need to have housing and need to have medical coverage. 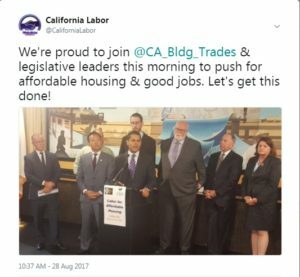 The California labor movement is a key driver of these bills. Dozens of workers and labor leaders went to the Capitol this morning to implore legislators to get these important bills over the finish line to provide much-needed affordable housing and good jobs to California communities. Rent is too high. Mortgages are too expensive. Workers aren’t able to afford to live in the communities they serve. The good news is that there are solutions to this crisis on the table. The package of housing bills we’re highlighting today will ease the burden on families statewide. Not only will it build homes, it will build communities through good jobs. Jobs that make our economy stronger. State Senator Toni Atkins’ bill SB 2 would provide a permanent source of funding for affordable housing, which addresses both the current need and future needs. Atkins strongly urged for passage of SB 2, which will provide $1.2 billion every five years for housing. Sen. Jim Beall urged passage of SB 3, a statewide bond that would infuse $4 billion immediately for affordable housing. Also attending were Sen. Scott Wiener and Assembleymembers David Chiu, Richard Roth, Miguel Santiago and Richard Bloom, authors of separate bills that provide for the streamlining of affordable housing projects. The labor movement is also supporting SB 1701 (Thurmond), which protects construction workers’ wages by holding a general contractor jointly liable for missing wages owed to a worker by a subcontractor on a private project. Some argue that building housing by paying construction workers poverty wages is the answer. Nonsense. Study after study shows that prevailing wage is a key ingredient in any solution to the housing crisis. Not only does it ensure quality work on taxpayer-funded projects, it means that those who build affordable housing can actually afford to live in the housing they build. Prevailing wage makes our economy and communities stronger through the creation of good jobs that sustain California’s middle class. Too many working people are struggling with housing costs. Legislators and the Governor have the chance to do something about in the next few weeks. The message today was simple: It’s time to act.